The Barber’s Chemicals service department has been a natural outgrowth of our company’s desire to meet the needs of our customers. When our customers ran into problems, we were happy to lend a hand. 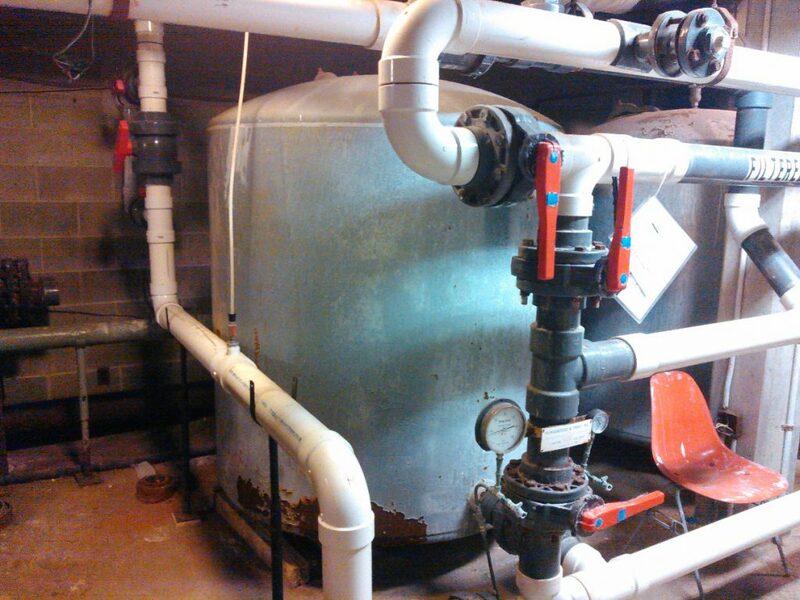 Over the years, we gathered more and more hands-on knowledge in helping customers, and gained more capabilities in every area of pool, water treatment, and wastewater treatment equipment maintenance and repair. The service department has taken several forms, and for the last eight years we have had a dedicated full-time service department. We make every effort to increase our knowledge and capabilities. Our staff hold Pesticide Applicator’s licenses, CPO certification, and regularly attend training sessions for everything from troubleshooting heaters to the correct and safe transportation of chemicals and their effective use. Our service department is proud to offer diverse services, from weekly to monthly pool monitoring with a service contract, to filtration system re-design and pump or heater replacement. We also install vinyl pool liners, safety covers, and will clean and repair pool surfaces in a safe and effective manner. 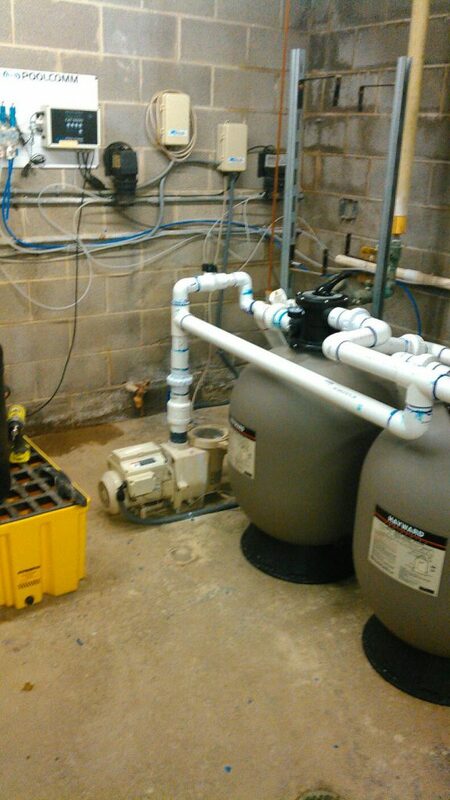 We troubleshoot and repair controllers, chemical solution pumps, heaters, filters, pumps, and UV units. The pictures above represent a before and after picture of the same location. 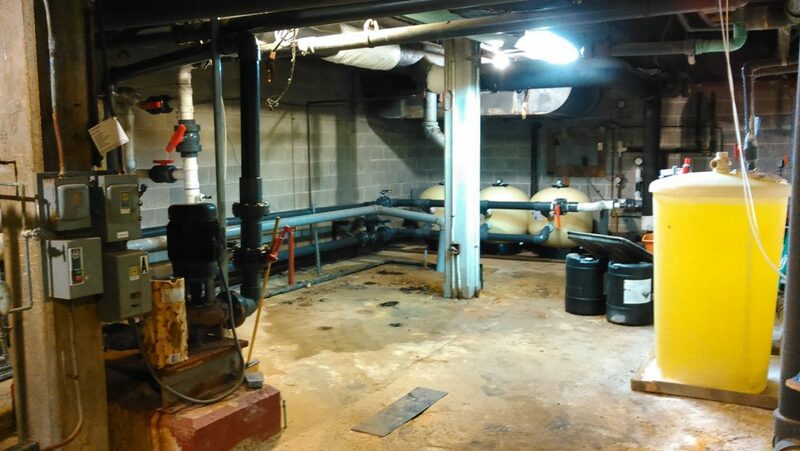 The rapid sand filters were replaced with high rate sand filters and a great gain was made in our customer’s available space. 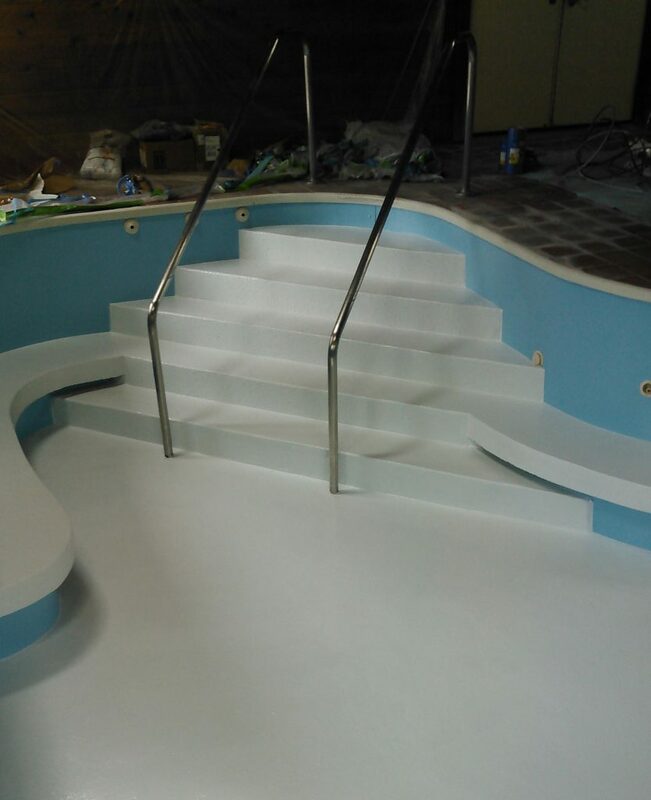 The above pool has a fiberglass wall and a concrete floor. The results of this two-tone paint job are spectacular. 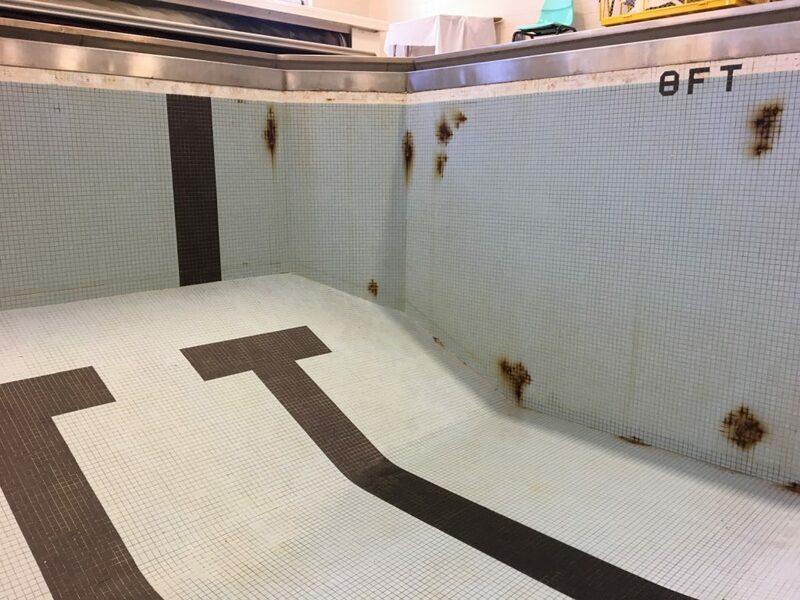 These two pictures above represent a pool which was acid-cleaned and then had its missing grout replaced with an epoxy grout suitable for immersion. The above pictures represent an unnecessarily complex system which incorporated non-pressure fittings and had two pumps drawing water from a single line. The problem became apparent when the recently-installed Stingl switches were shutting off the system because the pumps were alternately starving each other for water. 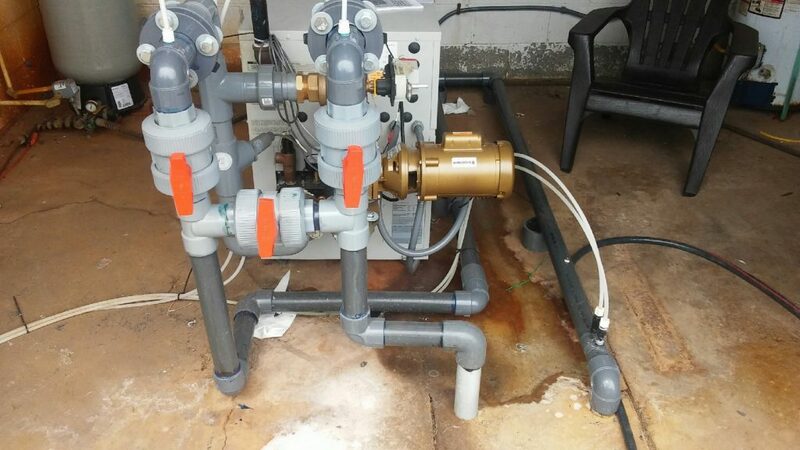 The solution was an elegant placement of two new filters and the repurposing of the two-speed pump which was already in use. Although one of the filters was cracked and spraying water, it wasn’t until we tore the other filter down that we realized that there was no sand in it; the laterals were broken and the center pipe had split. 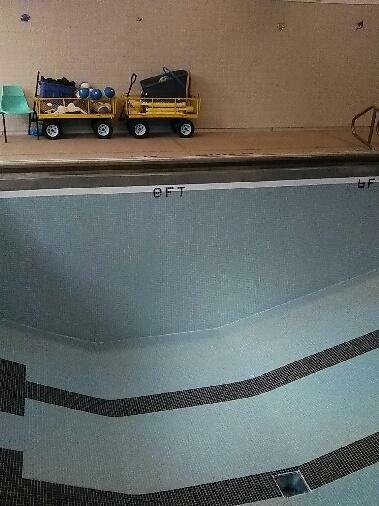 The pool had been running on one filter for an undetermined amount of time. 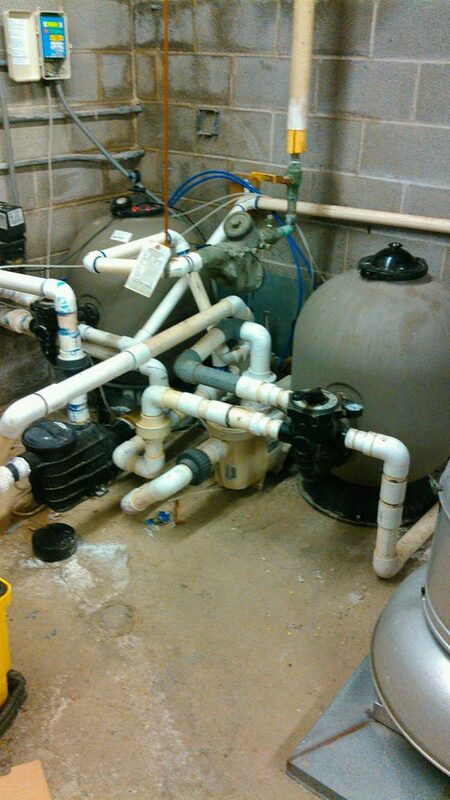 The water quality has improved wonderfully since our service department’s involvement. 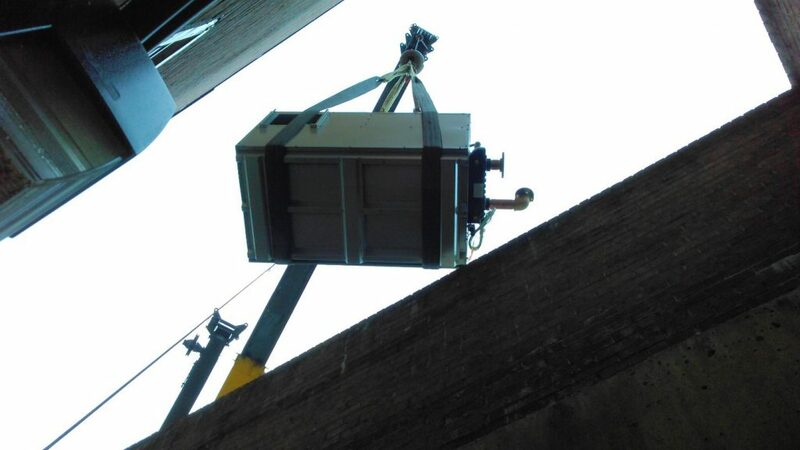 This is a replacement 1,121,000 BTU heater being lowered by crane to the basement as a replacement for the heater at right. 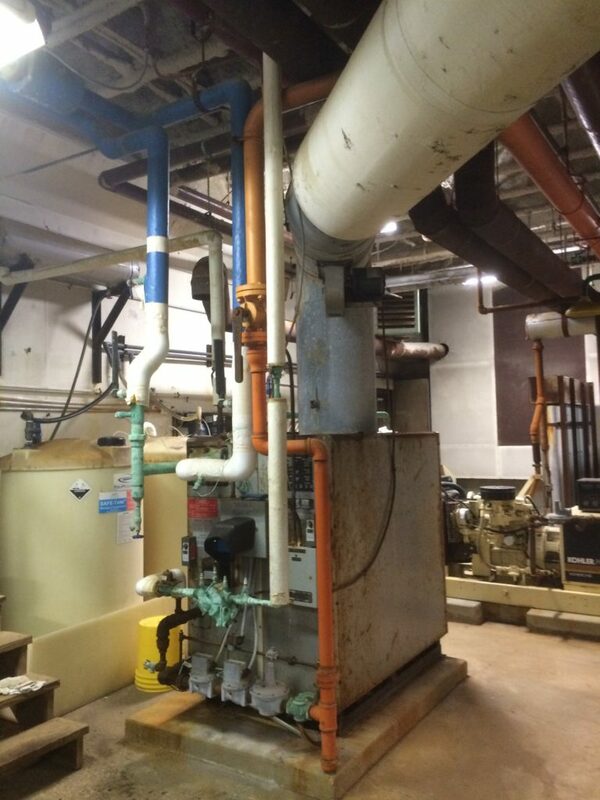 This is a 752,000 BTU replacement heater’s bypass valve system. The heater it replaced was taller and wider than the heater shown here. © Copyright 2019 Barber's Chemicals. All rights reserved.